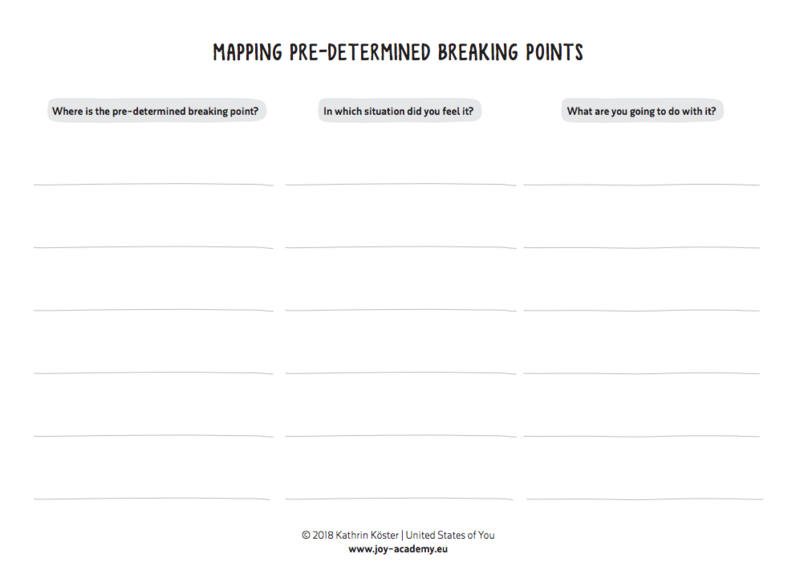 This toolkit helps you to explore your mind in order to open up your thinking and liberate yourself from self-limitations. 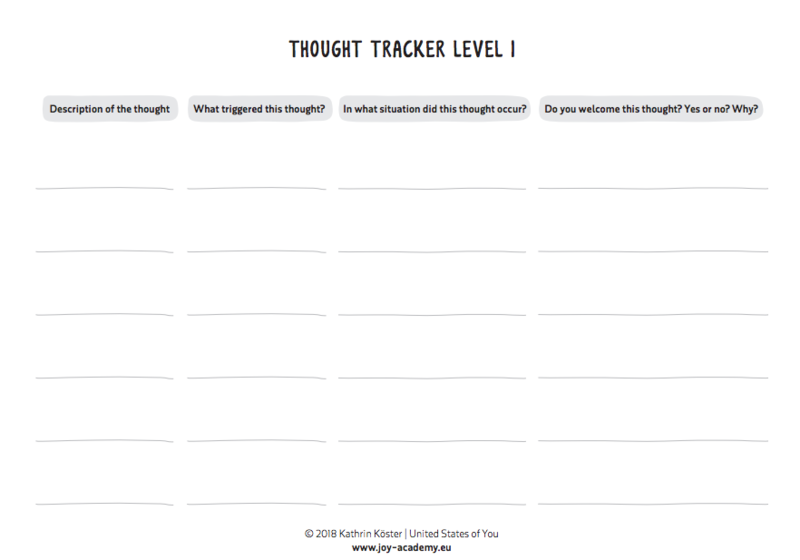 Thought Tracker Level 1 provides you with a better visibility of your thoughts. Where to start? You can either focus on re-occurring thoughts or thoughts you have NOW. You may associate certain feelings with thoughts you have identified. 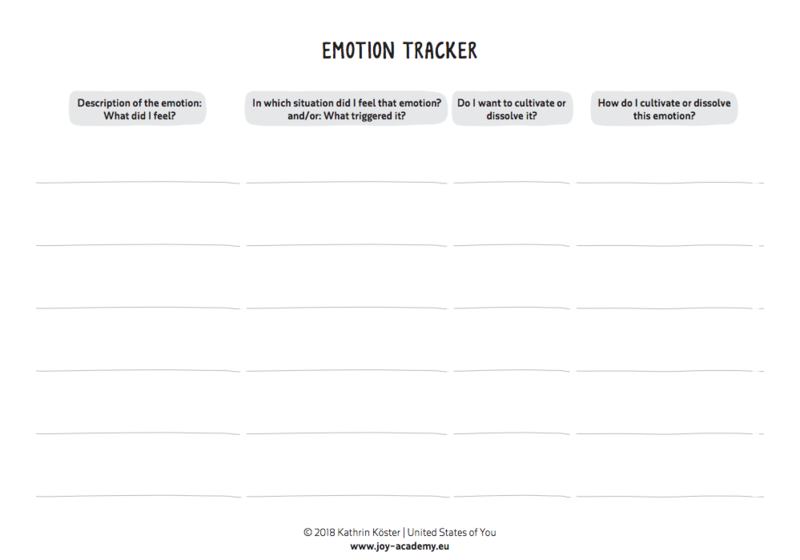 If you want to track them, you can use Thought Tracker Level 2 and work with both tracking tools in parallel. Tip: You may find it difficult to separate between ‘trigger’ and ‘situation’. Trigger usually is a physical sensation you have, e.g. something you see or smell. Situation typically refers to an activity you are conducting in that very moment. 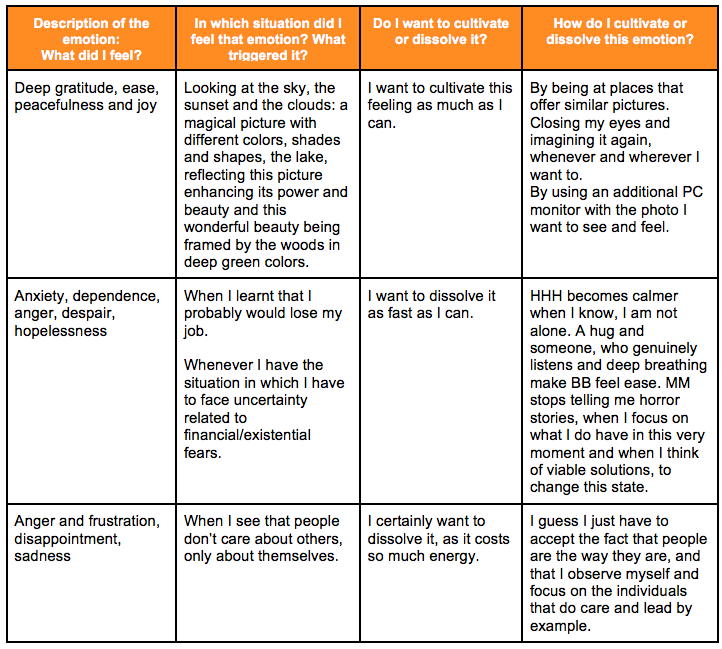 The self-perception tool is helpful to strengthen your self-esteem. Tip: It’s easiest and most efficient to use only one tag word at a time. 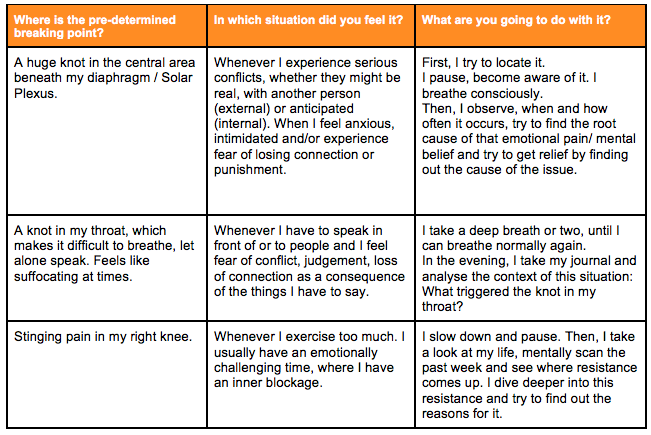 Here are some more examples as a kick-start to fill in your expectation tracker. What does my mother expect from me? That I call her regularly and tell her that I’m fine. What do my siblings expect from me? What does extended family expect from me? That I spend time with them and take active part in the family dynamics. Just being there is enough for them. The older women and some men of the family expect me to do what women do in those cultures. That I stay true to myself apart from what others expect me to say, do or behave. I expect myself to contribute to an open and balanced atmosphere, as much as I can. We tend to underestimate the physical aspects in our development journey. Systematic interaction with your body may trigger thought carousels and emotional roller coasters. You may also develop physical issues that are related to the attention your body receives while you read chapter 4. “This was a chapter where I felt rather restless, as I wasn’t really acquainted with this land. 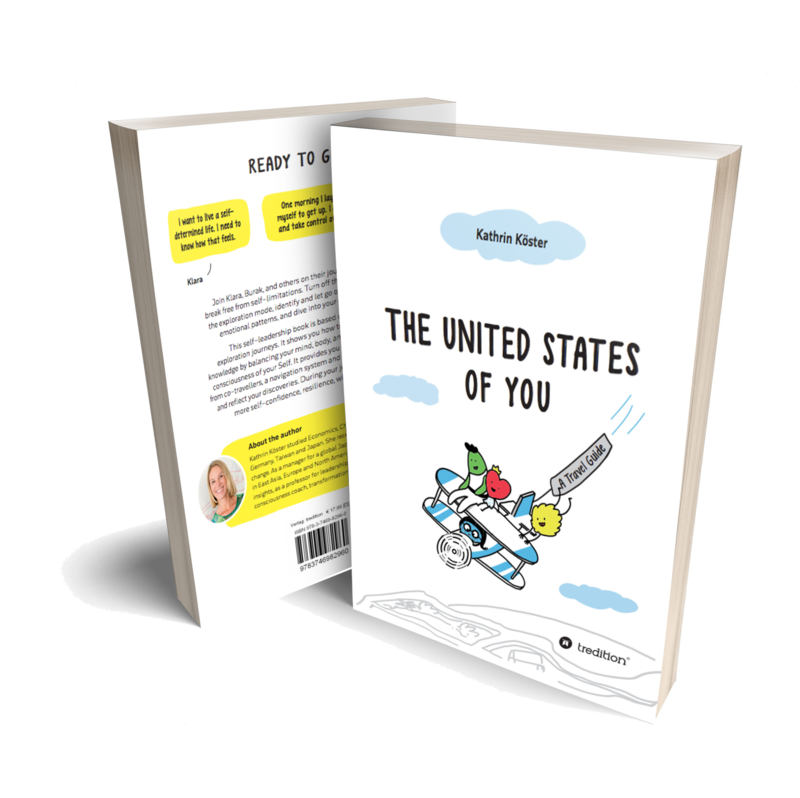 Here are some examples from your co-travellers that may kick-off your own self-exploration. Here are some examples from your co-travellers that may inspire you. You may want to focus on the third column and take a conscious decision regarding the emotional state you prefer. This is a big step to get out of the auto-pilot mode. 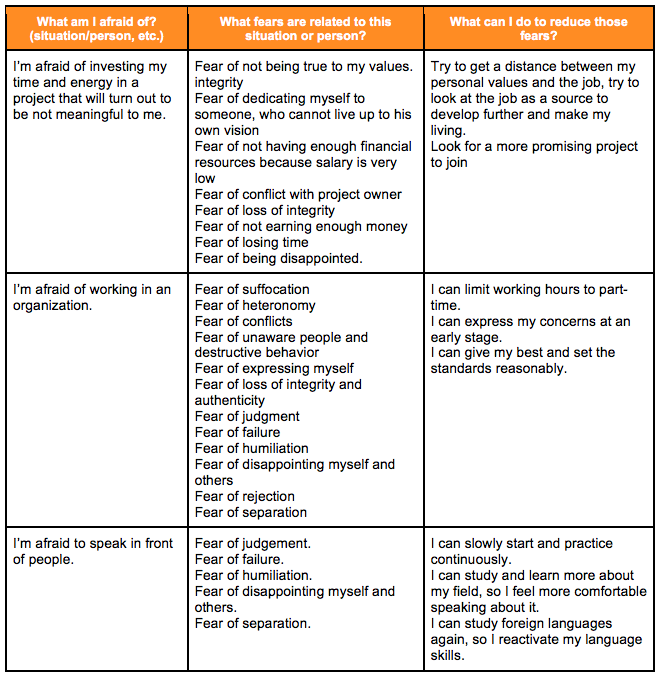 Here are some examples from co-travelers to give you a broader range of examples of fears in context. It might be helpful to cluster your needs around the following areas: Physical wellbeing, inner and outer peace, connection, play, honesty, autonomy, meaning. Here comes an example provided by a co-traveller that may inspire you to detect drama in your own environment. 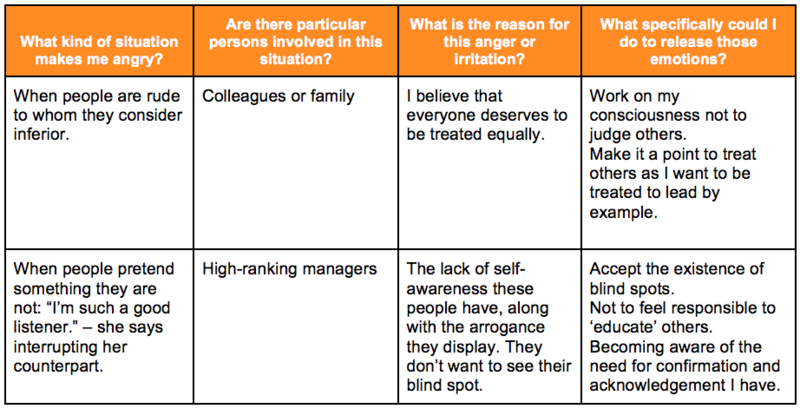 Drama is typically about unmet needs that trigger a whole plethora of negative emotions. 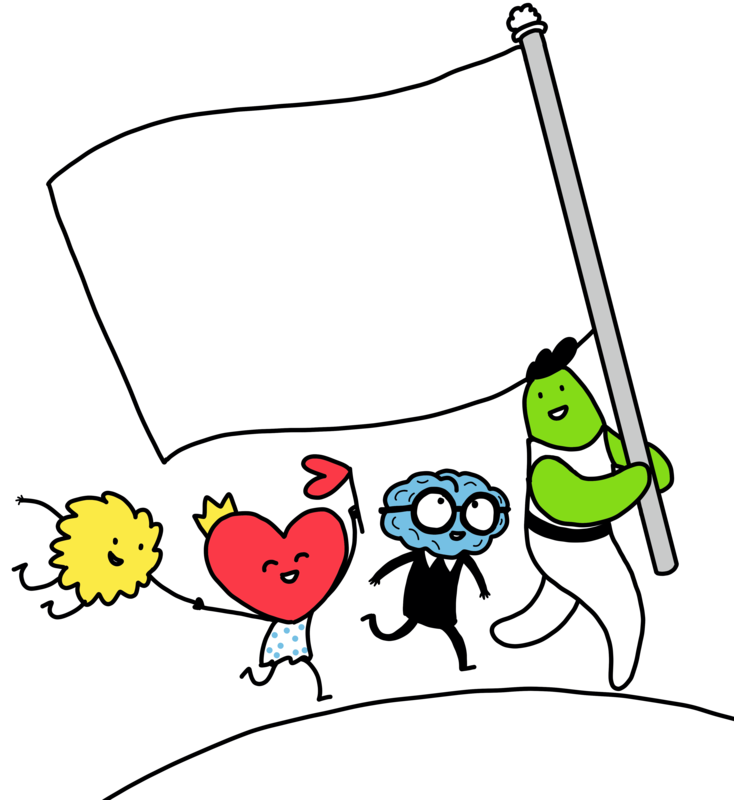 Unconsciously, drama kings and queens use dramas to fulfil their needs. 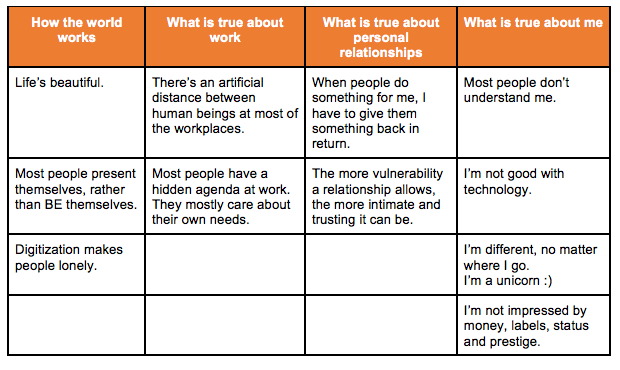 The drama self-check helps you to identify potential blind spots regarding needs you may have without being aware of them. It also helps you to get a clearer picture of people around you who seem to attract negativity or tragedy. What’s an issue? It’s a finding of a state of imbalance in your inside. The discovery of an issue marks the starting point of inner change. Issues trigger self-activation. They make you discover an inner strength that would finally resolve the issue. Issues pave the path of your journey. They might be related to an elusive feeling of something not being right. It’s good to get aware of them as they fuel your journey and guide you through it. 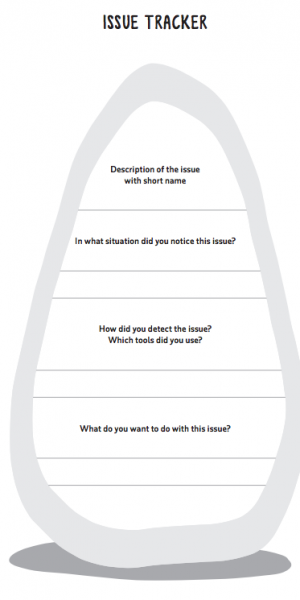 Any issue you stumble across is good because it provides you with more insights about yourself. An issue is symbolized as a standing stone. If it is detected and dealt with, it becomes a milestone of your personal development journey. Monitoring your issues helps you to detect mental and emotional patterns.